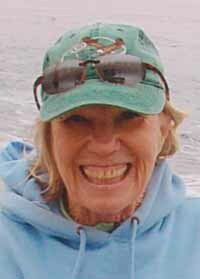 Glenna Doke, a resident of 35 years in Ketchum, died of an accident in Southern California on March 24, 2011. She was a very young 74 years old. Glenna was well known for her infectious smile and happy, selfless ways, loved her time in the valley and cherished all her numerous friends though all the years. To many, she was the mother of children of different parents, both in the valley and in California. Through the years living in Ketchum, she learned and loved to hike, hunt, fish, fly gliders, go camping, water ski, kayak, run rivers and do the other fun things we all live here for. She was blessed to have lived a magical life at a magical time and her smile and happiness showed that to all the people she came into contact with. Glenna was introduced to the valley by her sister Minnie in 1976, and like many others here, never left. She absolutely loved the mountains here and always enjoyed a glass of wine with the sunset. Glenna's first 45 years were lived in Southern California, where she was born No. 12 into a family of 18 children by her parents Adelaide and Lewis Doke. She graduated from high school at Gardena High and went to two years of technical school. She then married her first husband, Robert Kurtz, and started an advertising business where she won numerous achievement and excellence awards in the field of animation. After divorcing in the early 1970s, she then found love and solitude in Ketchum, Idaho, where she met and later married Bob Gladics of Ketchum and spent her last 35 years seeking fun and happiness. She is survived by her husband, Bob Gladics of Ketchum, and nine Doke brothers and sisters, George, Rocky, David, Dan, Bill, Laura, Trisha, Rena and Marjode. There are approximately 150 nieces and nephews on the Doke side of the family, mostly in Southern California. She had three children by her first marriage: her son Thomas A. Kurtz, known to the Wood River Valley as TAK; his wife, Masmi; their son, Keton; and two daughters, Tam and Michelle, with five more grandchildren by her daughters. There will be a celebration of Glenna's life with us all on June 26 at our home, 110 Bench Road in Ketchum, at 4 p.m. It will be a BYO (bring your own) music celebration, concert-type outdoor event. You will need your chair or blanket and picnic. Perhaps a glass of wine for sunset, as well. Potluck dishes for traveling folks would be welcome. The mood is to be happiness and enjoy the music.